This Christmas Blend chalkboard art is stunning. I stumbled upon it at the Starbucks located in the Seattle Municipal Tower in downtown Seattle, and had previously tweeted a lower quality photo of it. The other day I went back and got a much closer photo, and better quality, and I am sharing it here. (Not all my readers see my tweets). This kind of talent under a green apron has to be showcased! The package of Christmas Blend looks so realistic, and I like the beautiful numbers and letters. Thank you to partner-Scott who was willing to have his art spotlighted here. Starbucks barista chalkboard art in North Carolina – Blog post from April 2010 – Several beautiful pieces including a gorgeous “Honey Latte” chalkboard. 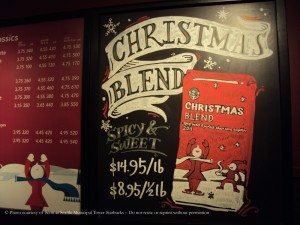 The chalkboard art contest at StarbucksMelody.com – This is incredible post from March 2010. The post includes over 30 beautiful pieces of art, all submitted by readers. So strange because I wrote a comment this morning while at starbucks and sent it but it seems it did not go through. Melody thanks for sharing and Scott thanks for your talent. So beautiful and it is so nice that the partners can share their talent to the customers. As I looked around at my local SB today, I wished we had more chalkart. The wallpaper is starting to tear and already the store looks tired and needing of an upgrade. Certainly during this holiday season some nice chalk art would make such a difference. Thanks again. @baroosta & Purple – It is an amazing piece of chalkart, and there’s definitely less chalk art now in stores than in year’s past. @Purple1 – Have no idea what happened with your comments. I just checked my spam filter and they didn’t get hung up there. Very nicely done! I really enjoy seeing chalk art in the stores, makes the place feel more warm and welcoming. But it seems fine now! Thanks again for sharing the chalk art! before I forget: @Melody (and Hayley and purple1:) I couldn’t get onto your blog at all this morning either……over and over and all other sites worked so???? This is a beuatiful example of chalk art. I would LOVE to do this at my store……I wish they’d let me. The digital age is a blessing. I can remember chalk art at the store my sister worked at back in 2002. My phone then didn’t have a camera and I don’t know if any phones had the internet. The point I’m trying to make is now this art can be shared and saved forever. Wow, that is so beautiful! I’d love to have a framed print of it to hang in my kitchen. My local Starbucks store does have nice chalk art most of the time. Maybe if a store doesn’t have any artistic partners they could see about having an art student from a nearby high school volunteer their talents to do some chalk art for them. Give the student credit and spruce up the chalkboard at the same time. I think you mentioned in an earlier post or someone did in comments that it would be nice to have a contest for partners having them do chalk art designs. @BeckyE – It does look so great it could be framed. I’d love to see Scott design next year’s bag! Though probably the design and ideas for Christmas 2012 are starting to brew now at the headquarters. Don’t come to my store! Mine looks like a kindergarten student did it in comparision! That is so amazing! All with chalk? I always thought the art was brought in from a corporate head quarters of something. The baristas do it? @Allie, Kaori, and Diele – So many talented baristas at Starbucks. Allie, yep store partners do their chalkboards. Glad you guys liked this too! I love good chalkboard art! It makes everything it represents more appealing. Wish my baristas were this talented.